We have been doing reviews of SBI Cards for some time now and we assume that you found the reviews useful too. Well, the card under review is a co branded card from SBI and Yatra. So, as the name suggest, this card is perfect for the ones who do lot of their bookings on Yatra. So, directly, this is one of the way to save more on Yatra which is apart from the savings on using the yatra coupons, yatra codes, yatra promo codes and yatra deals or yatra offers available on klippd. 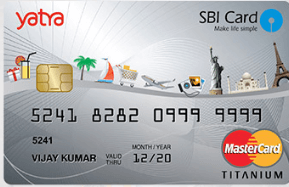 So, the total joining benefit of the SBI yatra card is worth Rs. 8,250. Now, these Yatra discount voucher are apart from the yatra coupons, yatra codes, yatra promo codes and yatra deals or yatra offers available on klippd. Apart from these, yatra voucher you will also get 6 reward points for every Rs. 100 spent on Yatra. This will translate into 1.5% cashback every time you make a spend on Yatra. Again this cashback of 1.5% is sponsored by SBI and is over and above the coupons of Yatra and ecash of Yatra. Also, one more bonus point is that you will get an additional 6 times reward points on the base fare. So, this is as good as 3% cashback on the base fare. If you spend more than Rs. 30,000 on Yatra, you get Rs. 500 worth voucher to be used on Yatra. So, if you happen to spend around Rs. 90,000, you will get Yatra voucher worth Rs. 1,500. So, the Rs. 500 worth yatra voucher is in multiple of Rs. 30,000. The 6 times reward points will also be applicable on spends at department stores, grocery stores. Get freedom from paying the 2.5% fuel surcharge on every transaction between Rs. 500 and Rs. 3,000. Enjoy exclusive access to the premium MasterCard airport lounges in India. The fees of Rs. 499 will be waived off , if you spend more than Rs. 75,000 in a year. Well, if you really see the card will be really awesome for all those travel enthusiast and users who book tickets regularly on yatra. In the last article, we had mentioned on how klippd can help you save cost on train tickets with Yatra. Well, if you get the SBI Yatra Card, the 1.5% additional cashback, will indeed be a boon. So actually all the travel agents and those who deal in the train ticketing business, should apply for the card. Well, if you want some free e-cash worth Rs. 2,000, you can download the Yatra App from here. But for all those, who do not make the transaction heavily on Yatra, should go for the SBI SimplyClick Card. We have done the review on the card in our earlier post. ← Is Xiaomi redmi 4A is best buy in Rs.6000?